Residents learned about proposed changes to MBTA service in and around Watertown on Monday night at the Watertown Police Station. MBTA officials visited Watertown Monday night to talk about changes to bus routes, increasing T fares and offering new ways for riders to pay fares. 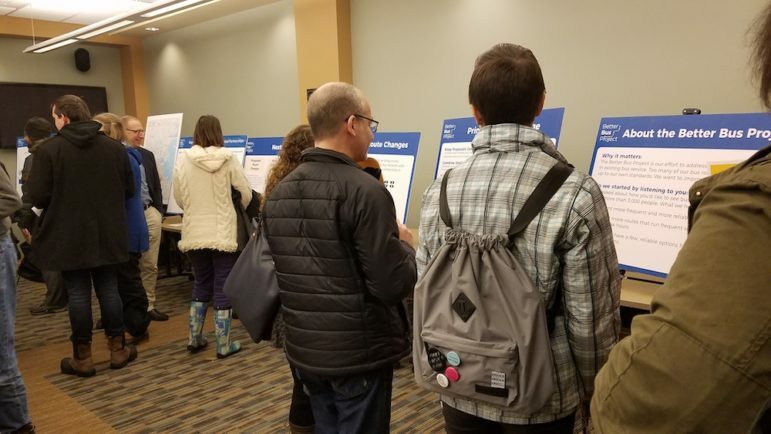 Those who attended the open house at the Watertown Police Station’s Community Room were eager to see ways the public transit system could be improved. One of Watertown’s major bus routes, the 70/70A, would undergo a major change. Currently buses on both routes run the length of Watertown along Arsenal Street and Main Street from Central Square in Cambridge to Waltham Center. At that point, the 70 goes continues on Main Street to Cedarwood and Market Place Drive in Waltham, and the 70A goes in a loop into North Waltham. The T’s proposal would split the 70A off onto a separate, shorter loop starting in Waltham Center and would cut off some of the current loop that goes as far as Trapelo Road near Rte. 128. According to information from the T, the change would add more trips along the spine of the route, from Cambridge to Waltham, and there would be about 3 minutes less waiting time. However, for those going to North Waltham, it would require a transfer at Waltham Center, which could be 15 minutes, and slightly longer wait time for people on the route going to North Waltham or from Cedarwood/Market Place Drive to Waltham Center. Watertown resident Michelle Cokonougher said the changes sound appealing. “It would be more frequent (from Waltham to Cambridge) because it is a shorter trip, and (the 70A) would be more frequent because it is a shorter trip,” Cokonougher said. A proposal would split the 70A bus route off of the 70 bus route in an effort to make the route more efficient and reliable. The 70A would go in a loop into North Waltham beginning in Waltham Center. The idea is not a new one. Former Watertown Town Councilor Aaron Dushku said it was came out a few years ago during a study of the Arsenal Street Corridor, a study on improving Watertown Square and other studies. He said he is happy to see it as a real possibility. Other buses in Watertown that will be impacted are express buses from Watertown Yard to Copley Square (the 502) and Downtown Boston (the 504). The proposed change would eliminate a trip around the Mass. Pike Exit 17 loop (around the Crowne Plaza hotel) for buses heading toward Watertown. The bus would make the loop on the trip toward Boston. Cutting out the loop would make the trip 3 minutes shorter for riders heading to Watertown, according to the MBTA. The idea appealed to Shannon Hasenfratz, who lives in Boston and commutes to Watertown on the express bus. She worries about the impact on people heading to areas south of the the Pike. “Even though it is a short distance, they would have to cross the highway twice,” Hasenfratz said. The proposed changes will have to go to the MBTA Board first, and if the board approves the changes could go into effect as early as the fall of 2019, according to the MBTA. See more information on the proposed changes to the 70/70A buses by clicking here. Information about changes to the 502 and 504 buses can be seen here. T officials also spoke to attendees about other planned or possible improvements. People were asked if they would like to have more shelters, heated and lit shelters, better wifi on buses and subways, and adding money to Charlie Cards in new ways. In general, Hasenfratz said she would like to see more information at bus stops, such as how long it will be for the next bus to arrive, or at least a schedule of when buses should arrive. “I should not have to have a smartphone to know where the bus is,” Hasenfratz said. Garrett Craig-Lucas would like to see improvements to the areas around the bus stops, particularly in Watertown Square. He lives in Somerville and commutes by bus to Watertown. He said getting around Watertown Square can be difficult. “I am more concerned with bus stop locations and safety of pedestrians in Watertown Square,” said Craig-Lucas. He added that it can be scary crossing anywhere in Watertown Square is tough, and/or getting to Watertown Yard, which requires crossing Galen Street and Watertown Street/Nonantum Road. Laura Wiener, Watertown’s Senior Transportation Planner, said she believes the proposals for the 70/70A and the express buses, “are good for Watertown.” She added, however, that there are more changes she would like to see to bring bus service to other areas of town. 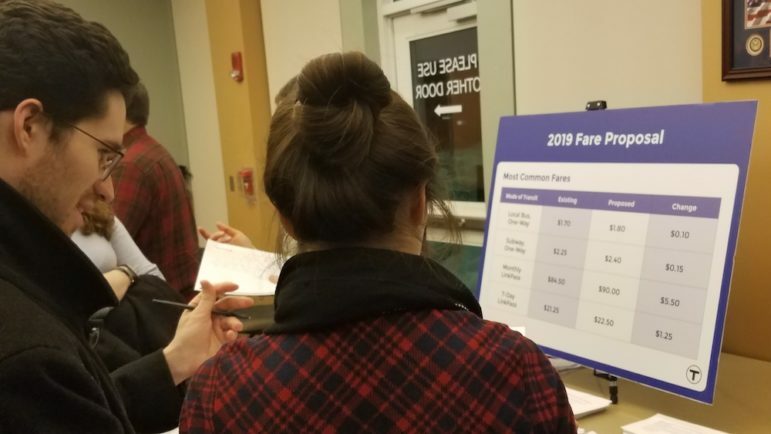 Attendees of the MBTA meeting looked at proposed fare increases. The MBTA will presented ways it is making it easier for people to pay fares, but at the same time the system has proposed increasing the price of riding the T.
The average amount of the increase is about 6.3 percent, according to the MBTA. The proposed new fares would add 10 cents to a one-way trip on a local bus (from $1.70 to $1.80). A one-way subway ride would go up 15 cents to $2.40. A monthly LinkPass would go up from $84.50 to $90 — a $5.50 increase. See more information on the proposed changes here. The T will make it easier for riders to recharge their Charlie Cards, by offering payment by smartphone or computers, adding more kiosks at stations or at bus stops, and have payment locations in stores. Riders, however, would not be able to pay on the buses. The result of the changes, MBTA officials said, will be shorter time boarding buses and faster trips. People won’t have to get on just through the front door and some bus drivers wait for passengers to add money to their cards before leaving a stop. Payments by smartphone will be almost instantaneous, with payments being added to cards in about five seconds. The T will also allow people to go “slightly negative” on their balances if their card runs out of money. I would like to see more covered areas at bus stops to get waiting riders out of the weather. Heat in those areas would be excellent. However, I am concerned about upkeep of those installations. Information about where the bus is would also be helpful. Having the 504 not make the return to the Watertown Yard around the hotel makes sense to me. I’d like to see the T start off simple, like having buses that are relatively clean and odor free. It gets tiring riding on a toilet with 4 wheels.